Raise your hand if you’re interested in costuming and make up tips from a global superstar. I’m literally waving both hands in the air and if you are too then you’re going to love this week’s blog post. I had the pleasure of chatting to Serena Ramzy last week about costumes, make up, practice routines, motherhood, overcoming choreographer’s block, her most treasured dance memories, how to prepare to dance to a live band and a whole load more. I knew Serena was generous with her knowledge but I was still delighted when she opened up about her life as a top international performer and teacher. We talked about so much that it turned out to be too much to put in one video! So here is part one: costuming philosophy and practice routines. Now grab a cuppa, sit back and enjoy! Thank you to everyone who sent in their questions for Serena, I did my best to get through as many as I could in the time we had. I’d love to know, in particular, what you took away from Serena’s personal approach to costuming. Do you struggle to find the right costume? How do go about choosing what to wear to perform? Be sure to comment on the blog below (we should have the security issue fixed now!) or on youtube. Stay tuned as next time we’ll be talking about more hot topics, including how Serena manages to balance motherhood with her dance career as well as how to prepare to dance with a live band – you don’t want to miss it so be sure you’re signed up to my mailing list! Ps. Our new Beginner Bellydance Essentials course is starting in just a few weeks in central Reading. Want in? Click here to get the full details, we’d love to have you on board. What does Serena Ramzy do before every performance? I feel supremely lucky to be able to count the sheer dance royalty that is Serena Ramzy as one of my dear friends. Over the years she has coached me, given me make up and costume advice and we’ve had plenty of adventures and girly giggles too (check out the photo of us above with two amazing dancers in Beijing). One thing I really admire about Serena is that, despite being a global superstar, she is incredibly open and generous with her knowledge and stories of her dance experiences. So when we decided to arrange a long overdue coffee and catch up at the end of this week I took the opportunity to (rather cheekily!) ask if she would be willing for me to literally film us supping on a latte and chatting about bellydance. I’m stoked to say that she agreed – yahoo! We’ll be nattering about all sorts of juicy topics from advice on costuming (who designs hers? ), performance preparation (how does she prepare?) to the trials and tribulations of being a top bellydancer and a dedicated mum. 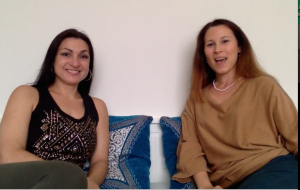 I’d love to know: what would you like to ask Serena Ramzy? Leave a message in the comments below with your question before this Friday 16th October. Or email me at mail@helenbellydance.com. “See ” you soon and in the meantime, I’d be so grateful if you were to share this with all your BFFS so they can chime in with their questions. Ps. Ps. Our new Beginner Bellydance Essentials course is starting in just a few weeks in central Reading. Want in? Click here to get the full details, we’d love to have you on board.